Moved from sansan invasion of hoshi. Ways to stop an invasion of the 4-4 point at the 3-3 point. I used the idea of responding to at . 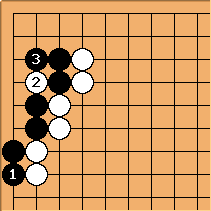 I thought this sequence turned out well for White, even though Black got a little territory. This next variation is when varies. I wasn't sure which move was better. BlueWyvern: I'd say is a bit of a trick play. 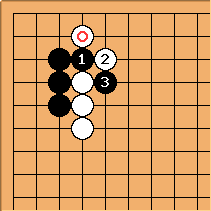 Black simply extends with and , then jumps to . 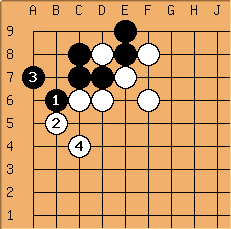 White needs to do something about the defect at a now, or Black will push here and rip White's position apart. 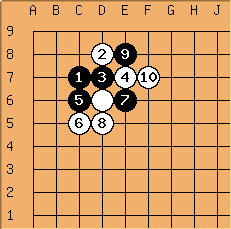 White cannot hane early at or b, or Black will cut at and or respectively. 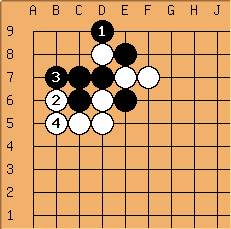 I'll leave it to the reader to work out the continuations with these hane's, but White has quite a desperate struggle. 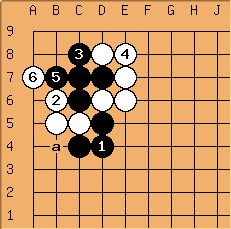 Alternately Black could try the push at first with the cut of which leads to a very one-sided fight in favor of Black, especially if Black has a good ladder. Regardless of how you look at it, is very bad for White if Black responds in a correct manner. 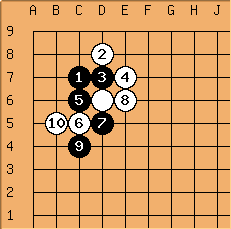 HolIgor: Your move is worth consideration in the case when there surrounding is such that Black does not get an easy life when breaking into the center. 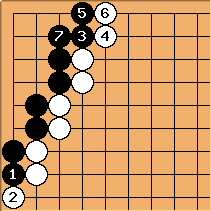 After writing all these diagrams I realized that they all hinge on the idea that White would play , and that Black would try to cut. 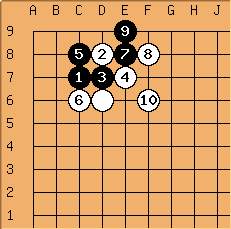 JuhoP: This and the diagrams below do not make sense. 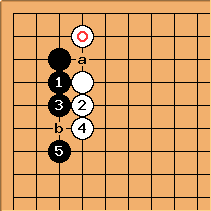 Just look at the page on 3-3 invasion for reasonable variations. 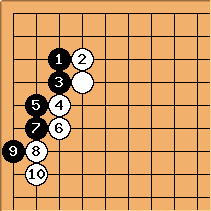 SAS: is wrong - White has too many cutting points. This is discussed on the 3-3 point invasion page. Togi2Benji? : What if , ? Karl Knechtel: Then ; White cannot really cut here.